With winter always around the corner, it is important that your boiler is ready to handle the upcoming chilly temperatures. The majority of households in the United Kingdom rely on their boiler to provide hot water and space heating. 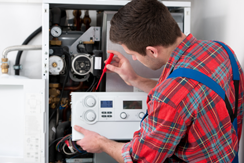 If a boiler breaks down, it can often take time to get it repaired or replaced. This is the last thing that you want to encounter during a bitterly cold winter. A boiler breakdown in the middle of winter could force you to have to use secondary electric heaters which are less effective and more costly to operate than a central heating system. By having your boiler fixed well before winter arrives, you can rest assured that you will be warm and toasty all winter long. All boiler manufacturers recommend that every boiler should be serviced at least once a year. Regular maintenance can help to avoid any unexpected breakdowns or costly repairs. But many people like to wait until early winter before they have their boiler repaired or serviced. This often becomes a regrettable decision. If you choose to wait until winter to ensure that your boiler is in proper working order, you should expect to wait a considerably longer time. This is the busiest time of year for boiler engineers in the United Kingdom and everyone is constantly out on repair, service, and installation jobs. As many clients have discovered the hard way, waiting for a boiler repair in the middle of winter is much colder and much more uncomfortable. If you want to ensure that your boiler will keep you warm all winter long without delay, you should fix your boiler during the summer or the early autumn. Although property owners may have their annual boiler servicing scheduled for the winter, that doesn’t mean that any detected problems with your boiler should be ignored in the meantime. By waiting until the winter, you could face longer delays and possibly a much higher repair bill. That’s the last thing you need during the expensive Christmas season with gifts to purchase and parties to host. Ignoring boiler problems can cause problems to escalate. Always deal with issues as soon as possible. Fixing your boiler promptly will ensure that your home continues to be warm throughout the winter season. It will also ensure that your central heating system performs as efficiently as possible. Without regular maintenance, systems gradually become less efficient. If your boiler has a deficiency, it may not be performing optimally. Fixing your boiler now will ensure that when the cold temperatures set in and energy bills go up, your boiler will operate as efficiently as possible to keep your heating bills low. If you neglect problems and avoid having your boiler fixed promptly, you may be putting your boiler warranty in jeopardy. Most manufacturers recommend an annual service and if that service is not conducted, your boiler warranty will be voided. The last thing you want to happen is to have your boiler breakdown in the winter only to discover that the necessary repairs are no longer covered by warranty. Have your boiler serviced before the winter and ensure that any necessary repairs are fixed immediately. Whether you are in Crouchend or Shoreditch, NXG Heating is never far away if you are having a boiler emergency. We can conduct emergency boiler repairs all across London. Our professional Gas Safe registered boiler engineers are highly experienced with all types of domestic boilers. For those requiring annual service or a non-emergency repair, we can offer you an affordable fixed price with no hidden fees. As a trusted name in London boiler repair, count on NXG Heating to fix your central heating early and affordably so that you don’t get stuck out in the cold.